No matter where you live, climate conditions are not always conducive to allowing us to practice golf outdoors as often as we’d like. If you find that you don’t have the time to play a complete round of golf, there are a few simple indoor golf practice drills that will greatly improve your skills and impact your score. Additionally, practicing golf drills indoors can help you focus on certain components of the drill. One of the most basic concepts to remember is to simplify your swing. Too often, beginning golfers will make their swing too complicated. When practicing your swing, the goal is to “hit with your turn”, focusing on the rotation of your body. Keep in mind that golfers oftentimes make the mistake of simultaneously turning their shoulders and hips, which throws off torque balance. Also ensure that when working on the technique of your swing, and before each shot, take one attentive, deliberate swing which mimics that technique. This will help you become accustomed to the new technique or motor skill you’re trying to accomplish. It will also help you focus on the progression of the swing. Many golfers often neglect practicing hitting wedges at awkward distances, such as 35 or 75 yards. However, they often face these shots every time they’re on the course. Indoor golf is the perfect place to practice these shots at difficult distances. One of the best practicing drills you can find in an indoor golfing facility is practicing with sand surfaces. 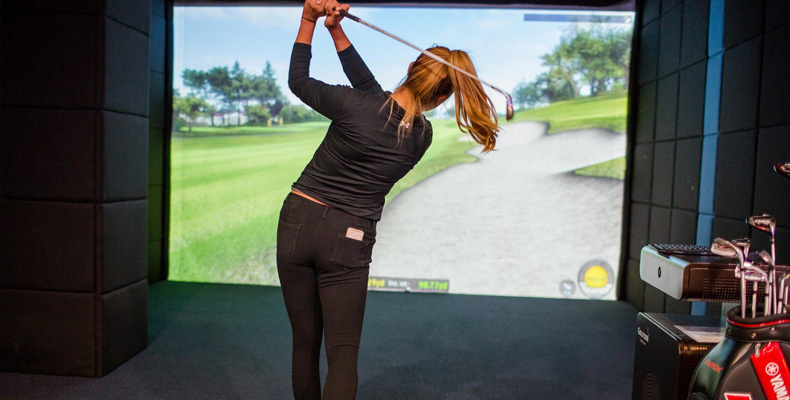 Swing Zone Golf uses a the GOLFZON Simulator that features customized settings for various play conditions including weather, location, and tee height. It also utilizes a Swing Platform that simulates fairway, rough, and sand hitting surfaces. One of the advantages of practicing at the Swing Zone Golf facility is the ability to play on courses all over the world, without leaving the building! This allows you to practice on a vast array of conditions, distances, elevation changes, and various training modes using 3D graphics technology. Playing your best game of golf is about practicing harder and smarter. It’s not about talent. Practicing these drills and focusing on the fundamentals can help you improve your skills and take your game to the next level.